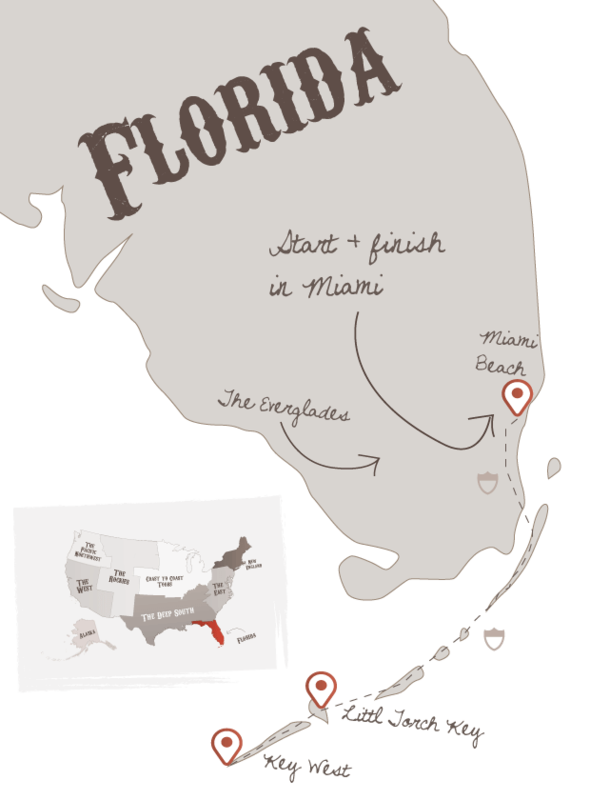 A chilled out road trip of under 500 miles, our Miami & The Keys tour is a great starter trip offering sun, sea, sand and the open road. After a week in Miami, cruise down the famous “Overseas Highway” to the southern most point in America – Key West. Touch down in glamorous Miami for 2 weeks of fun in the sun. Collect your car, and cruise over Biscayne Bridge whilst on your way to Miami Beach. Miami has some of America’s best hotels, and we’ll find just the right one for you. Miles of sandy beaches which are backed with glitzy Art Deco hotels and sprinkled with attractive residents coming to and from model castings. A great place to cruise around, walk the boardwalk or enjoy a meal while you people watch. Forget Miami Vice, this area is classy and the hotels are amongst Americas best. Miami is packed with great shopping options from giant malls to the trendy boutiques on Collins Ave. Whatever, your tastes or budget - Miami has retail therapy covered. Miami is home to many fine examples of Art Deco architecture due to the fact the city first became popular back in the 1920’s. Over the years, some of these fine buildings fell into disrepair, but today the tourist dollar has come to the rescue and the neglected buildings are now back to their former glory.This is Art Deco heaven for any architecture fan. Now that you’ve settled into your Miami Beach holiday, why not spend the day relaxing on the legendary sands that run the entire length of Miami Beach. Whilst enjoying the beach, check out the cool life guard huts that watch over the Atlantic coastline. 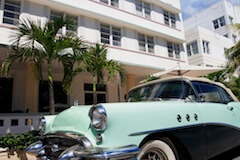 Why not leave the barrier island of Miami Beach today and explore the mainland area of Miami. The Design district is one highlight, and it can be easily accessed via the Julia Tuttle Causeway. Another favourite for visitors is the Vizcaya Museum and Gardens, this is a national landmark and museum that is well worth seeing. Driving back to Miami Beach after a day on the mainland is a real treat too, the city lights sparkle in the background as you drive back over the Biscayne Bridge to Miami Beach. If you’ve had enough of the pool and the beach, then the Coconut Grove area on the mainland makes for a nice day out. Cocowalk offers great shopping and cruising around some of Miami’s oldest streets is charming. Leaving Miami today, you’ll drive the 150 mile “Overseas Highway” all the way to Key West, taking you along a string of small islands linked by a road set on stilts. Once a refuge for presidents and writers, the keys now serve tourists and oddly free roaming chickens. Once at Key West, check out Sloppy Joe’s, Duval Street and soak up the laid back atmosphere. It’s time to relax now as you are at the southern most point of America and close to the Caribbean. So, soak up the vibes and relax in the chilled out atmosphere of the Keys. Why not take a stroll around Key West today. Perhaps enjoy a nice lunch at one of the many bars or restaurants on offer here. Dive with the fishes and Jesus! The final destination on this road trip awaits, as always we’ll select a resort to meet your budget on one of the many islands that lie between Key Largo and Key West. America’s best diving can be enjoyed on these islands, and these mid islands are a great base for diving. Find a palm tree, a good book and just relax. Pool or Beach? You decide. The last full day in Florida today, and another day spent relaxing in the Florida sunshine. Today, you’ll cruise back up the Overseas Highway back to Miami. Drop of the car at the airport, before catching your overnight flight home. Don't forget to check out this road trip's Itinerary tab to see more amazing pictures from our "Miami & The Keys" tour. You'll also be able to read a little bit about what you'll be getting up to on each and every day of this incredible holiday adventure.